Often, as introverts, extroverts approach us wanting to make conversation. For introverts, the challenge is getting beyond the small talk and into a deep conversation where our introversion (good questions, thoughtfulness, curiosity) can shine. Small talk is an essential part of human interaction. It helps us size up the other person, build rapport, and begin to trust each other. In practice, small talk is like a warm-up for conversation. The good news is it doesn’t have to last long. Less than five minutes is enough time to make introductions and get the basics out of the way. Then, both parties will feel comfortable going deep. So, if small talk is necessary, how do you do it well? First, if you don’t know the person, introduce yourself – Just a simple “Hi, I’m Amy” is a good way to start. 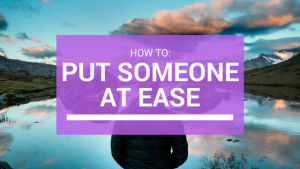 Then, ask how the person is feeling – At first, just ask “How are you?” or “Doing okay today?” These common courtesies are important because they signal that you understand social rules and care about the person. Finally, ask why the person is at the event/party/etc – This is an easy way to find common ground. Try “How do you know [insert host’s name]?” or “Is this your first time coming to [insert event name]?” Based on the answer, you can ask more questions about the relationship with the host or what brought them to the event. What do I talk about next? The secret is not to talk more. 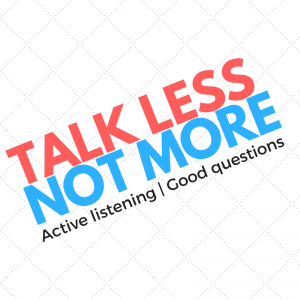 It’s to talk less. Yes, that’s right. If you want to keep a conversation going as an introvert, you need to talk less. We all know that extrovert who takes over a conversation and can keep telling stories for as long as necessary. As a result, a lot of introverts feel like that’s the only way to keep a conversation going. As an introvert, if you try to keep a conversation up based on your own talking, you’re bound for a tough time. Most of all, it starts with good questions. Instead, asking “How is your day so far?” begs an explanation. What made your day good? Additionally, it allows the person to think and possibly tell you their day is not good. Now we’re getting somewhere. I know, I know. That exchange sounds so cheesy. Believe me, though, I have used those exact questions, almost word for word, countless times. Almost inevitably, I get to an interesting conversation topic based off of how well the person’s day is going. Before you write this technique off, try it. Most of all, in every sentence your conversation partner says, you should listen for something you can ask a question about. As you’re listening, don’t worry about what you’re going to talk about next. Instead, think about what questions you can ask. It’s simple advice, but this fundamental shift in approach – from talking to asking – will transform your conversations. A general rule of thumb I like to use is I should be talking only 20% of any conversation. Because of your questions, the person will feel interesting and important. If you’re asking questions all the time, the conversation could start to feel like an interrogation. Instead, try using “It must have been hard/scary/exciting/etc to do x.” A sentence like this will probably get followed up with more information. Then, you can return to asking questions. Finally, let’s talk about body language. You want the other person to feel comfortable talking and sharing with you. Body language is subtle, but it has a huge impact on how we feel about another person. Most importantly, active listening comes first. If you focus too much on mirroring, you won’t have content for your follow-up questions/statements. One final word on going deep: You’ll still have to talk a little bit. In my conversations, I aim to only be talking 20% of the time. That’s it. During those times, I try to be as honest and genuine as possible. Almost always, I’ve found that people respond well to honesty and vulnerability. And those that don’t, you didn’t want to spend time with anyway. After you say a sentence or two, follow up with another question to get the other person talking again. If you follow these steps, you’ll find the transition between small talk and deep conversation becomes much easier. You’ll have the tools – the good questions – to get you past the Small Talk Trap. With practice, you’ll be closer to building authentic relationships with the people you meet. What about you? Have you had success with any of these techniques in the past? Maybe you have some techniques of your own? I’d love to hear your experiences. Hate going to events to meet people, and want to learn how to create introvert charisma? Join Bennett’s insider’s list to get access to exclusive material, word-for-word scripts, and in-depth guides for introverts. Speed Networking: What IS the Point Without the Follow Through? Hi everyone! (Thanks to Patricia for running my guest post!) I’ll be checking the comments over the next few days to answer any questions/comments. 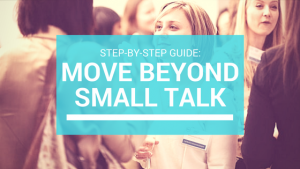 What’s your biggest challenge moving beyond small talk? Thanks for providing quality content for my readers Bennett. And for being ahead of me with your offer to check comments! Yes, I have used this ice-breaker with someone I don’t know , “How did happen to come to this event?” You may find that you have a common interest that brought you to the event that will help you to transition to a more substantive conversation. The key is to ask questions that don’t ask for a “yes” or “no” response. No, I don’t ask how their day went, and other such questions, because they will then ask me that, and I don’t want to talk about it (small talk). Small talk started with people who may be able to help us, in anyway, can often lead to deeper and longer lasting relationships. The choice of how to proceed is our own.